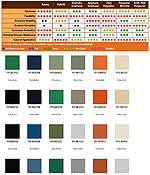 All Color Samples on the above page are approximations only! Your monitor WILL vary from the true color. PLEASE CALL FOR ACTUAL COLOR MATERIAL SAMPLES. Blast only for the “rust look”.